The perfect excuse to try this delicious Mocha Coffee Coffee Cake with Espresso Glaze!! This cake has three (yes, count em… three) delicious flavors marbled together: vanilla, chocolate and espresso. 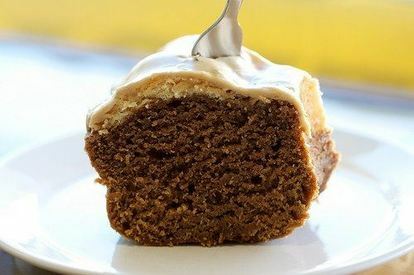 The coffee cake is moistened by sour cream, which also creates a light and tender crumb. The texture is smooth and light. The Bundt type pan ensure that the cake bakes relatively quickly, without drying out. Essential. This cake is delicious with milk or coffee, and tastes even better when you’re wearing pajamas. True. Put a rack in the middle of the oven and preheat to 350 degrees F. Generously butter and flour 8- inch (6 cup) Bundt pan. Combine butter and sugar in a large bowl and beat with an electric mixer at medium speed until pale and fluffy, about 2 minutes. Add eggs one at a time, beating well after each addition, then beat in the vanilla. Add flour mixture alternately with the sour cream, beginning and ending with flour mixture and mixing until just incorporated. Transfer about one third of the batter to a small bowl. Add espresso mixture and stir until combined. Transfer 1/3 of the remaining vanilla batter to another small bowl and add the cocoa mixture and stir until combined. Spoon all three batters into the Bundt pan, alternating so each flavor is distributed through the pan. Bake until cake is golden, or until a wooden spoon inserted in the center comes out clean, 55 to 60 minutes. Cool in pan on a rack for 30 minutes, then invert onto a rack to cool completely. Stir together espresso powder and 2 tablespoons coffee in a bowl until powder is dissolved. Add confectioners’ sugar and stir until well combined. If glaze is not pourable, thin with remaining coffee if necessary. Pour glaze over coffee cake and let cake stand until glaze is set, about 10 minutes, before serving.